The footage recorded by surveillance cameras was published by Obozrevatel media outlet showing the events around a parked car, hours before it was blown up as a prominent journalist Pavlo Sheremet was driving it on the morning of Wednesday, July 20. The explosive device was planted on the bottom of the Subaru, which Pavlo Sheremet drove July 20 to get to the office, by an unidentified female suspect, according to Obozrevatel, which published the footage earlier today. The record shows that she had a male accomplice. Read alsoVigil after slain journalist Pavlo Sheremet held in Kyiv (live)An unidentified male suspect at 00:22 (time shown at CCTV camera recording) approaches the parked vehicle, which got blown up later in the morning. The man walks up to the car, sits down near the driver's door and prepares everything for the planting of an explosive device – he cleans the bottom of a Subaru. Read alsoSheremet assassination: FBI joins Ukrainian investigatorsAt 02:33, a man and a woman go in the direction of the house where Sheremet lived, keeping an about 15-meter distance from each other. The woman carries a bag or package, which is notably heavy. According to Obozrevatel’s sources, the investigation believes that the bomb was inside the bag. At 02:38, the two meet, seem to exchange a couple of words and go to the opposite sides of the road. The man begins to imitate the gait of an intoxicated person. Read alsoSheremet’s murder: Versions, eyewitness accounts, public reactionsAt 02:39, the man goes down the road, while the woman stops by the Subaru, apparently takes the explosive device out of the bag/package and plants it at the car’s bottom (under the driver's seat), after which she leaves. The process of planting a bomb took less than a minute. According to the publication’s source close to the investigation, the law enforcers believe that the man, who remained across the street, “spotted” the female killer. The source added that the Subaru’s traditional parking spot outside Sheremet’s house was occupied by a van with license plates of another region. Once the Prytula’s car was parked in another spot, the van left. It is yet to be verified whether this was a coincidence. However, he version is being checked whether the van parked there deliberately, to facilitate the killer’s work by forcing the driver to park the vehicle farther away from the windows and thus make it easier for the culprits to plant the bomb. 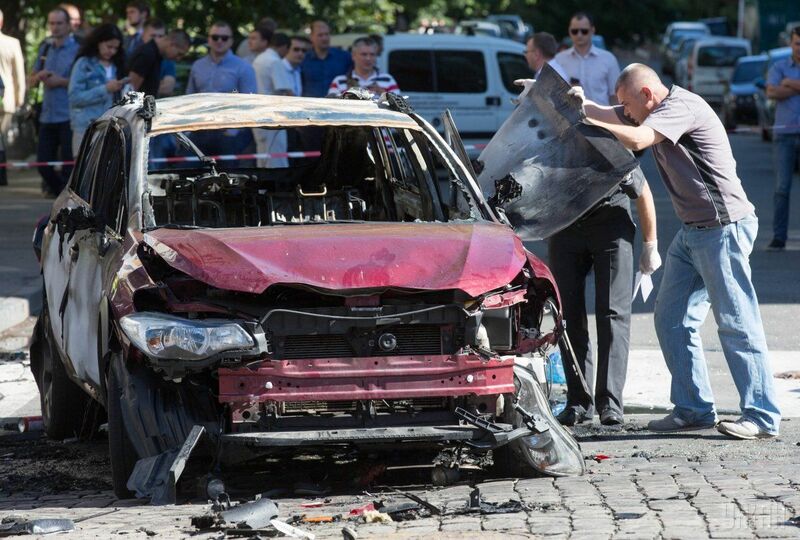 Read alsoUkraine's President orders immediate probe of journalist's deathAs UNIAN reported earlier, a journalist from Ukrainska Pravda online newspaper Pavlo Sheremet was killed in a car blast on the early morning of July 20 in Kyiv center. The vehicle belongs to the owner of the publication Olena Prytula, the journalist’s significant other. Ms Prytula was not in the car at the moment of the explosion. The death of the journalist, who worked for Ukrainska Pravda, was ruled a premeditated murder, committed in a manner that could have threatened the lives of several people. The investigation considers six versions of the murder, but the officials have only announced four of them: professional activity; hostile private relations or personal motives; a Russian trace (destabilization in Ukraine); a murder attempt against Olena Prytula.